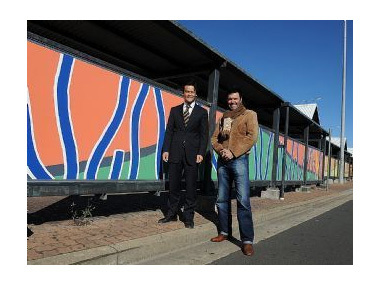 COMMUTERS visiting Campbelltown railway station will have their day brightened thanks to a public art project by Aboriginal artist Adam Hill. Sydney-based Hill was commissioned to design 80 panels around the station including at the taxi rank and the bus interchange. Hill's panels draw strongly on the urban environment and on Aboriginal culture. The project replaces a series of panels placed around the station about 10 years ago as part of another public art project. This installation has been jointly funded by Campbelltown Council and Arts NSW. Mayor Anoulack Chanthivong said Hill had spent a month working on the panels. "Over a one month residency at Campbelltown Arts Centre, Adam Hill has created some distinctively vibrant murals which reflect our city's Aboriginal heritage and modern urban landscape," he said. "The murals will significantly enhance the visual amenity of Campbelltown railway station, one of the busiest and most utilised transport interchanges in our city, and the Macarthur region." The painted lines on the panels are the eucalypts bordering the urban centres, appearing collectively as the four ceremonial colours of the earth according to Aboriginal people. Each of the panels is 1.02m high and 2.85m wide and Hill has completed the designs and painted the panels after being commissioned by Campbelltown Arts Centre. As well as exhibitions in Australia, Hill has shown his work in 12 countries and been the subject of 10 solo exhibitions.